The barbecue was not only a chance for us to meet the crews who were having work done at MB’92 over the winter, but also a chance for those attending to learn about the recent changes to how tax authorities around the world are sharing information about account holders worldwide. Financial expert Roy Duns and his team from St. James’s Place were on hand to answer questions about our recently published article on the Organisation for Economic Co-operation and Development’s Common Reporting Standard (read the article here). 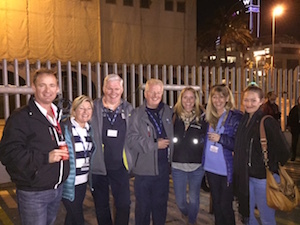 It’s always great to have good quality time to discuss the business of superyacht operations with senior crew so we can better understand their needs and frustrations, all with the aim to do our job better as superyacht managers. As such, we hosted an intimate private dinner at local gastronomic hotspot, the Michelin starred Via Veneto. 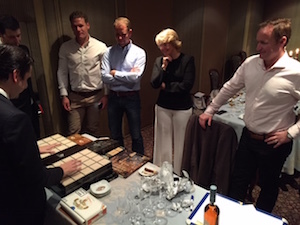 The evening also included a whiskey tasting and educational demonstration of how to light a cigar for someone else – a good trick for guests – and a top-of-the-line humidor, of which the King of Spain owns a replica. Highest respects of the night went to Jako Hall of M/Y Hampshire II, who won a bottle of vintage whiskey for his top marks on the blind tasting.